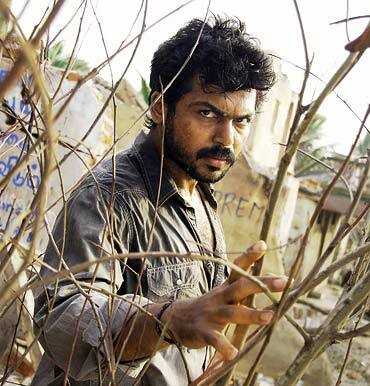 Karthi is on a golden run -- all his films Paruthiveeran, Aayirathil Oruvan and Paiyya are hits. Naturally, his fourth Tamil film Naan Mahaan Alla is eagerly awaited. Naan Mahaan Alla (I am no saint) is directed by Susindran who made one of the most appreciated films of last year, Vennila Kabadi Kuzhu. Kajal Agarwal is Karthi's heroine in the film. With three hits in a row, are you going to be the golden boy of Tamil cinema? I don't know. I don't think so. I am just a normal actor trying to do good work. Actually it has been a long journey for me from being an assistant director to an actor. I had been waiting for this day. To you, it may seem just three films but to me, it was years of hard work and a very long one. Were you dreaming of this day? Not exactly. I never dreamt to be an actor but I always wanted to be in films. The title of your new film is Naan Mahaan Alla (I am no saint). Who are you in the film? I am not a saint [laughs]. I play a middle class Chennai boy and the film is about his life. The values shown in the film are middle class. The film shows how positive a guy could be. After shooting films outside Chennai, that is wandering on the roads of in Madurai for Paruthiveeran and in various jungles for Aayirathil Oruvan and on the National Highway for Paiyya, I have been wanting to do a film in Chennai, and this film is the result of that desire of mine. It was like coming home. Is it a family drama? It is actually the guy's journey through his family, his first love, his first job, etc. And then, something strange happens in the city and that affects the family. Are you being made a mahaan in the film? Is that the reason for the title? It is an abstract way of saying what the film is about. In fact, the climax of the film justifies the title. The director had many titles as he was looking for a title that is similar to Naan Mahaan Alla. Then, everybody suggested, why not use that title itself if it suits the story. He then spoke to Balachander Sir who happily gave us the title. Do you think the title gives you an advantage? Yes, it gives us an edge but then we opted for the title only because it suited the story. In the case of a film like Billa, it was a remake but this is a different story. Only the title is the same. Susindran's Vennila Kabadi Kuzhu was different and was appreciated by all. Is that the reason why you accepted his film? I saw a strong film-maker in Vennila Kabadi Kuzhu. But it was entirely the character that I play in the film that attracted me, and also his journey. I play Jeeva who is full of enthusiasm, energy and looks at life positively. He loves his life and the people around him. What is different about this film is that everything about the story is very real; nowhere will you feel that it is a film. The dialogues are natural and the entire film is that close to life. There is no cinema in the story. Could you see yourself in the character? Very much. Paiyya is a film where I look like myself. But here I am myself. It is very difficult to be yourself on screen; you can only be as natural as possible. But Jeeva is very similar to me. Yes. My co-stars used to say, 'you are so comfortable doing the scenes, you must be this guy.' I was completely at ease. Susindran always preferred the first take and wanted me to be as real as possible. Did you enjoy doing the film? Very much, especially the romantic scenes [laughs]. Everything about the relationship is middle class; how the girl and boy find out each other's phone numbers, how they first talk, how they meet in public, etc. You said you enjoyed doing the romantic scenes. Were they like what you experienced in real life? I do not have these kind of experiences at all! That is why I enjoyed doing them. For the first time in my life, I rode a bike with a girl sitting behind me. You mean, you never got a chance to go around in a bike with a girl? I was never allowed to take the bike to college; I went by train. So, where is the chance? All the opportunities I never had in real life, I got in this film [laughs]. That is why I am enjoying my life as an actor! I can live the life of other people. You have a beautiful heroine in Kajal Agarwal. Yes, she fits the role perfectly. Her expressions are hilarious in the film. For her, it was like a breath of fresh air as she has done Telugu films where everything was over the top; always well-dressed and with make up. But in this film, she is so fresh and simple and looks so beautiful. She has come a long way from Magadheera. Was Susindran very particular that all of you have a normal look in the film? Yes. I wore clothes which every normal middle class guy would wear. I was also particular that I should not look like a hero at any point in the film. In films, when the hero is with his friends, he always stands out which I didn't want. I should be one among the friends. You have done four very distinct characters so far in your career. Which was the toughest? Paruthiveeran was the toughest. Paiyya was also tough because I had to be graceful and towering all the time. How was Susindran as a director? He was quite easy to work with. We had rehearsals for a week before shooting. Only my scenes were rehearsed and we shot that with a video camera. So, when the shooting started, I was quite comfortable with all the scenes. Because we rehearsed, the output was better. Susindran had rehearsals for Vennila Kabadi Kuzhui also as he had all newcomers in the film. When he said, why not we try for this film also, I was ready for it. It really helped when we started shooting. Both of us knew what we wanted, so we were in perfect sync. We were very comfortable with each other. Recently Kamal Haasan said, there should be rehearsals for every film like actors do for stage performances. All Hollywood films also have script reading and rehearsals. In this film, the director wanted it, and I agreed. Initially I thought it would kill the spontaneity but in the end, I found that it helped. I was very clear about what I was supposed to do. Anyway, acting is not about doing what you want to do. It is written in the script what an actor is supposed to do. With rehearsals, you improve every expression. It saves time and film! Instead of doing various takes, you give your best in the first take itself because you have rehearsed. Why didn't the other actors join you in the rehearsal? The director wanted me to rehearse because I am there throughout the film and have most dialogues. You talk a lot in all your films. It is very strange. I am always talking in all my films. That is how I am in person too. I like to do films with a lot of humour. Of course, there should be emotion too. She bunked school and won a TV show!